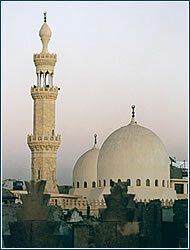 In the 1001 Nights, it says “He who hath not seen Cairo, hath not seen the world”. While visitors are intrigued by the city’s twisting streets, oriental bazaars, and Islamic architecture of sculptured domes and minarets, they should also be prepared for some negative aspects of culture shock. 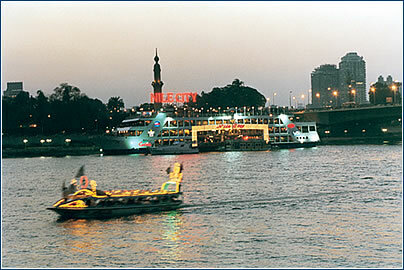 Favorite attraction: Evening cruises on the Nile. Best-kept secret: Sweet desserts every day. Local candy stores are excellent. Advice: Immediately after your arrival, reconfirm your return air tickets. Best-kept secret: Ancient Arabic market Khan el Khalili. Advice: Don’t miss a cruise on the Nile. Favorite attraction: The program “Sound and Light” among the pyramids in Giza, and dinner on a boat with a program of belly dancers and dervishes. Best-kept secret: Head of Pharoah Djoser near the step pyramid in Sakkara. 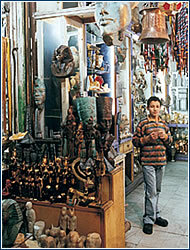 Favorite shop: Most shops at Tahrir. Advice: Don’t eat leafy vegetables, and don’t give any money to kids; it’s very difficult to get rid of them later. goafrica.about.com/cs/cairo/a/cairo_guide.htm – this “essential travel guide” offers info about how to get there, and what to see when you arrive. 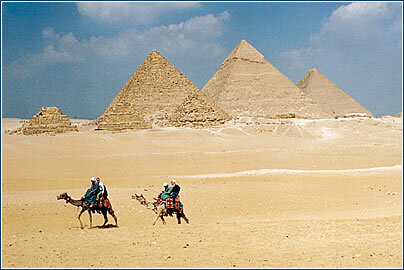 wordtravels.com/Cities/Egypt/Cairo – good one-stop overview of the city: attractions, sightseeing, accommodation, etc. · Tourism is Egypt’s key source of foreign income, while the public sector, including government and social services and the military, makes up the largest “industry”. 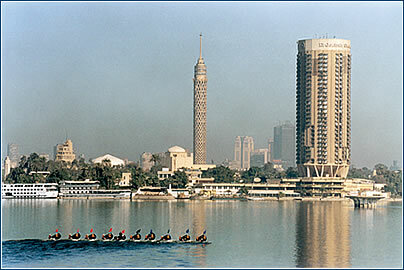 Cairo is also the center of a growing trade, finance and insurance sector. · With a GDP of USD 68.8 billion in 2001-02, Egypt has the third largest economy in the Middle East and North Africa region. But Egypt is still an emerging market, moving from nationalized industrial economy to one that is increasingly being led by the private sector. Reducing unemployment, primarily by encouraging private sector initiatives, is a state priority. · Although total revenues have been falling in recent years, petroleum remains one of the key industries. With gas reserves of 57 billion cubic meters and more reserves being exploited, Egypt has become the 12th largest natural gas producer in the world. Oil companies such as Mobil, Esso and Exxon are all investors here. · Tourism, manufacturing, construction, communications and transport, are all showing significant expansion. The government has also pledged to make hi-tech development a priority, and to attract export-oriented manufacturers to establish bases in Egypt. · Courtesy and hospitality are important in business dealings and Egyptian life in general. The host of a business meeting should be sure to offer guests some tea or a small snack before commencing the meeting proper. · When drinking with Egyptians, visitors (especially women) should only ever partake in moderation. · Tact and diplomacy will be required to conduct business meetings and much will be gained by a close observation of the way local businesspeople operate. In the Arab world, it is considered the height of bad manners either to display anger or to openly criticize another person in public. · In this Muslim country, women should not offer to shake a man’s hand, but only do so if the man offers his hand first. They should dress smartly for business meetings and always dress modestly. Government offices are open 8:30am-2pm, except Fridays and sometimes Saturdays. Muslim businesses may be closed on Thursday afternoons and Fridays.